With Valentine’s Day just around the corner, my thoughts turn to romantic Aromatherapy. There are blends to diffuse that can be appropriate for the occasion, but I already discussed diffusers. There is another method of environmental fragrancing that is more personal and more appropriate for the holiday. Aromatherapy jewelry – it can help to enhance the mood and would make a great gift. There are several forms of wearable Aromatherapy jewelry. 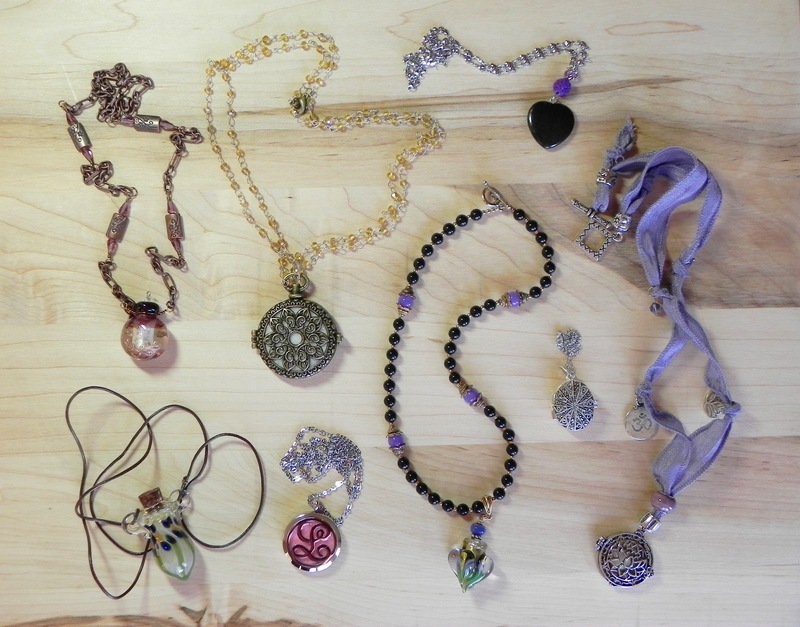 I dabble in jewelry making, so I have created several necklaces with diffusers that are appropriate for essential oils. Some pendants have a cork to seal in the essence which is removed when needed so the essential oil can be sniffed. Another form has felt pads or cotton balls that are inserted into a perforated pendant so that the oil is smelled constantly. Recently I made necklaces with porous beads that absorb a drop or two of oil for passive diffusion. At an art show, I saw the porous bead design but they were made into earrings. (I will be making these soon). Earrings are another way to wear your Aromatherapy. Pixie Glassworks has several designs including earrings with glass diffusers. They aren’t in my jewelry collection yet, but I have a friend who owns one of their creations and it is pretty and functional. So, whether it’s for Valentine’s Day or just for fun, Aromatherapy jewelry is always in fashion. You can fill the pendant with essential oils to help alter mood (maybe for stress), keep from getting sick (with an immune blend), charge your brain (and stay awake), or by having a favorite perfume around. The scent can be changed as soon as the previous one has evaporated allowing you to switch out your essential oil couture on an almost daily basis. It’s a beautiful way to stay healthy. ← Essential Oils for Asthma? Yes! All material provided on this website is for informational or educational purposes only. Please consult a doctor or other medical professional for the treatment of serious medical conditions. Always use essential oils with caution and do not use on children under the age of 5 without professional guidance. ©2014-2017 Elemental Aromas LLC. All Rights Reserved.